Mid-Continent makes a wide variety of aircraft instruments. 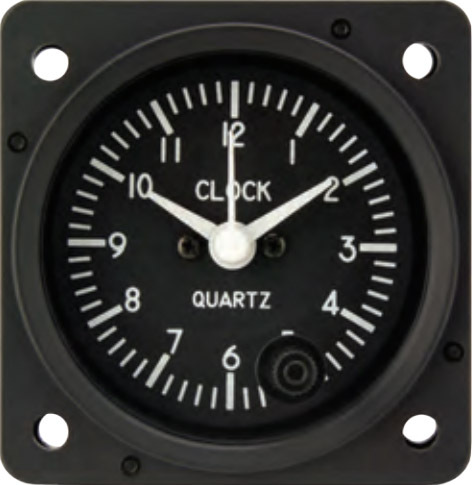 Their analog electric clocks are very nice for use in a sailplane. They have a clean and simple design - making them easy to read at a glance. They run great on 12V from a glider battery, or a 9V battery. I like the simple, elegant design of this analog clock. It fits into a standard 57 mm (2 1/4 in) instrument hole. 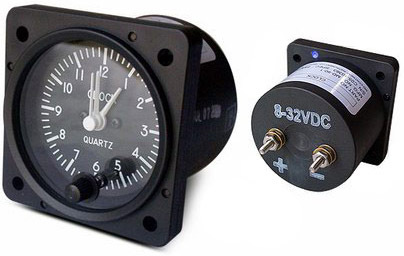 10 to 32 VDC power is required to keep it running. If you remove your glider battery between flights, you'll need to reset the clock before flight. But it is very easy to set. It requires only 3 mA of current. The back of the unit states that it runs on voltage as low as 8 VDC. For use in a sailplane I was curious how long the unit would run with a 9V battery or 8 AA batteries. I bought a 9V battery connector at Radio Shack. It ran continuously for 3+ weeks on a single 9V alkaline battery. 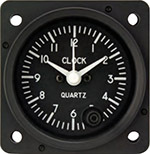 If you only connect the clock to the 9V battery while flying, it should last through an entire soaring season easily. I then tested it with a Radio Shack AA battery pack that holds 8 AA batteries (8 x 1.5V = 12V). It ran for more than 3 months.